On Tuesday 4th April 2017 The Royal Ark Mariner Province of Northumberland held their Annual General Meeting at Corbridge Road Newcastle upon Tyne. There is no doubt that the highlight of the evening was the Dedication of the new Provincial Banner. 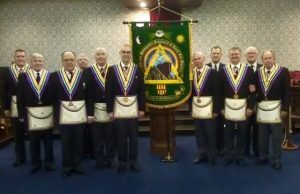 During the ceremony the Provincial Chaplin W Bro Stephen Young gave a well researched oration, this included a short history of Royal Ark Mariners in Northumberland and a history of the development and use of banners in Freemasonry in general and the new Provincial Banner in particular. The oration was well received by the brethren. The meeting in general was very successful with eight brethren receiving Provincial Grand Rank Appointment and a number of brethren receiving NMBF collarets. The photograph shows the new banner in all its glory with the PGM, DPGM, APGM and the banner dedication team. W Bro Stephen Young is on the far right of the photograph.